A1: Compete against other players and guilds in the Kingdom! Score goals and earn the most points to emerge victorious! 1. Each Lords Cup will have 4 matches. Lords Balls will spawn at the start of each match, and players will have 90 minutes to attack. Points accumulated from all 4 matches will go towards your final score. 2. Each troop tier has a different kicking skill, allowing them to kick the Lords Ball for different distances. You must have the required number of troops of that tier to use the skill. 3. Tap the Lords Ball on the Kingdom Map, hold down the skill icon, slide towards the direction you want, then release to send your troops marching. Once your troops reach the Lords Ball, they will use their skill to kick the ball in the specified direction. 4. When the Lords Ball lands, the 8 tiles around it (including the ball itself) will be regarded as the active Lords Ball area (9 tiles in total). Points will be awarded if any part of this area lands on the Base, a Fort, or the Wonder's Land. The Lords Ball will disappear after scoring at one of these goals, and will respawn randomly on the map. If this area lands on a Darknest, points will also be awarded, but the Darknest will disappear and respawn instead. 5. If the Lords Ball lands on an obstacle (Player Castle, Camp, Field, Rich Vein, Rocks, Woods, Ruins, Gem Lode, Monster, Lords Ball, Lake, Shore), it will be moved to the nearest empty tile (Grassland, Forest, Rock Pile, Magma Path, Lava Hill, Tundra, Wonder's Province) in the same direction.6. Your troops will gain a Travel Boost when you kick the same ball consecutively." Q2: What is the participation requirement for the Lords Cup? Do we need to register? A1: Only unprotected Kingdoms and Kingdoms whose protection ends in fewer than 60 days can participate. A2: No registration is required. All guild members may participate in this event when it starts, and complete the Solo Cup and Guild Cup event. A3: If you are guildless when the event starts, you can only complete the Solo Cup event. Q3: How do we participate in the Lords Cup? A3: Kick the Lords Ball towards Darknests, the Base, a Fort, or the Wonder's Land to earn points. Wonders award more points than Darknests. 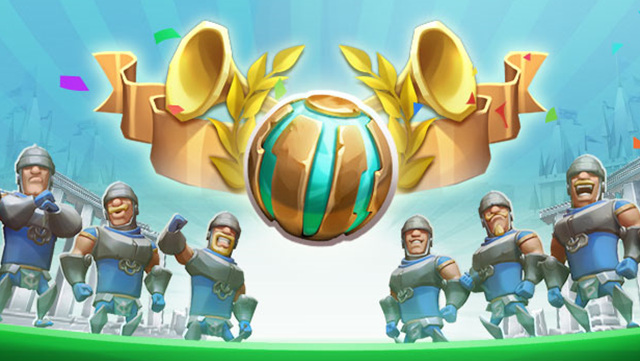 Your troops will gain a Travel Boost when you kick the same ball consecutively. Please check the in-game events board for more details. Q4: How do I find the Lords Ball? A4: Tap on the [Kingdom Overview] on the Kingdom Map to see the Ball Zone when the event starts. Q5: There are so many Lords Balls on the map! How do I know which ball is the one that I have previously kicked? A5: Tap on the 'Track Ball' icon (round icon) on the right in the Kingdom Map, and the system will show you the Lords Ball you have previously kicked. You will still be able to track balls if you quit and relog into the game. However, the tracking will not work if the Lords Ball has been kicked to a Wonder by another player and has already disappeared from the map. Q6: My guild's home Kingdom is in another Kingdom. Can I participate in the Lords Cup in my current Kingdom? A6: Yes. You can still earn points for yourself and your guild when in another Kingdom. Q7: Can I quit and join other guilds during the event? A7: Yes! If you quit and choose to remain guildless, you can only complete the Solo Cup. Guild rewards will be given out to all current guild members at the end of the event. Q8: There are multiple matches during the event. Can I score during all these matches? A8: Each event will have 4 matches. Players can participate in all 4 matches. Points accumulated from all 4 matches will go towards your final score for rankings. Q9: I kicked the Lords Ball into two Darknests and both disappeared, but the system only shows that I've scored one! A9: If the Lords Ball hits two Darknests of different levels, they will each have a notification message. However, if it hits two Darknests of the same level, only one message will be shown. Points will still be awarded for kicking the Lords Ball at two Darknests.